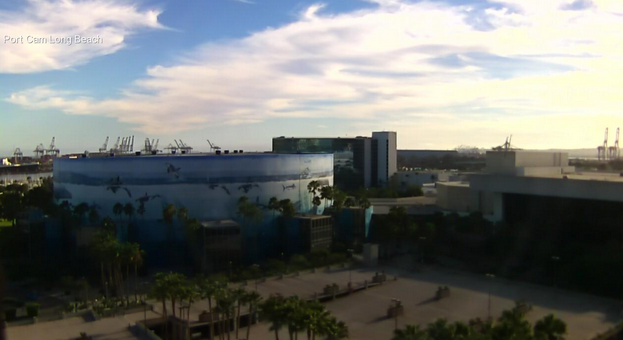 This Long Beach webcam shot is looking over the Long Beach Convention Center towards the Port of Los Angeles. Here is a great view of the LB Convention Center. LBCC holds a range of events all year long. In April, motorsports come to Long Beach with Formula E, Formula Drift, IMSA WeatherTech Sportscar series, and the IndyCar Toyota Grand Prix of Long Beach. This is also home to the world famous Aquarium of the Pacific. They have the most amazing aquatic exhibits. Deals and discounts are always great so be sure to check out Aquarium discount information. Don’t forget about all the whale watching deals and opportunities that are available in and around Shoreline Village. Harbor Breeze Cruises operates from Rainbow Harbor and whisks patrons out into the Port in the hopes of seeing gray whales, blue whales, killer whales, dolphins, seals, and other marine wildlife. Find great deals on whale watching with Groupon! This area is rich in history and should be explored if possible. The town is large and encompasses many different ethnic groups, cultures, and ideas about life. Food choices are amazing and the area boasts the largest Cambodian population outside the country of Cambodia. Take a look at all the local Long Beach attractions too. There are so many things to do in downtown – for example, getting a great meal at a local restaurant, or enjoying an adult beverage at one of several awesome watering holes in downtown. And, if you need to get that mop trimmed up, then Long Beach has a plethora of barber shops to choose from to make you look great again. Long Beach is great and that’s why we show it off!